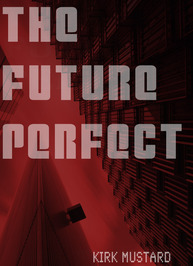 Today I have a guest post from Kirk Mustard, author of The Future Perfect. I spend a lot of my time living in the future. That’s why I write about it. It’s what I know best. I live in the future because it’s the only drug-free way I know to escape the present and the past, two of the most poorly designed places I know. The past is full of regrets, embarrassment, mistakes, bad memories, and relatives one-upping you. The present is full of heavy traffic, high prices, pollution, crime, frightening politicians, disease, wars and threats of more wars, a disappearing animal and plant population, and relatives one-upping you. The future, on the other hand, is perfect. There, robots do all of our work and our power and food are free. We spend our time in joy and harmony, and have overcome the fear of aging, death and bad hair days. But to reach this utopian world we must first live through the most magnificently insane dystopian societies imaginable. That’s what my novel is all about. The Future Perfect seems to work not only as sci-fi, but as satire for people who normally don’t like sci-fi. The basic theme is computer technology greatly blurring the distinction between fiction and reality in people’s lives. For example, when a person dies a computer generated image of them takes over and can be called on the video phone. Though the concept was created simply to ease one’s sense of loss when friend or relative dies, soon people start enjoying these computer generated personalities as much or more than they did the real person. Subsequently, the fear of death and the concept of death is basically eradicated. The plot involves the creation of a new animal called the Smelix. While still only theoretical, this creature ignites a battle over whether to replenish the decimated earth with a completely man-made ecosystem. I grew up in Kansas in a tiny one horse town minus the horse. It was a great place to cultivate my imagination because the only way to feel like I was living in someplace wonderful was to imagine it. After college, I moved to California to be a actor. But I changed to writing when I realized that actors had to run all over town to get rejections, while writers got their rejections delivered right to the door. I do, however, still post commentary and some skits on the Internet. I can always hope that one of them will go viral. I used to fear things that were viral, now I want to be infectious. One thing I do like about the present is that writers no longer have to find and agent or publisher. I found trying to get a literary agent more painful than trying to get a date in high school. In fact, the process has inspired a new novel. It will be up about a writer who is so frustrated with the process that he becomes a serial killer. On each new body he leaves his next chapter. The public worries who will be the next victim, but they also look forward to the next installment. It’s called Killer Novel. Anyway, I finally stuck my novel on Kindle and the next thing I knew I was selling copies, getting some very good reviews and that has been very satisfying. However, for old times sake, since I am my own publisher and agent, I sometimes send myself a rejection letter. Good science attempts to save the planet from bad science. A funny, insightful look at humanity, its destiny and relationship to the Earth. When the Earth’s last wildlife preserve is destroyed and the planet is dying, society turns to a fictional animal to make things right again.